Yum! 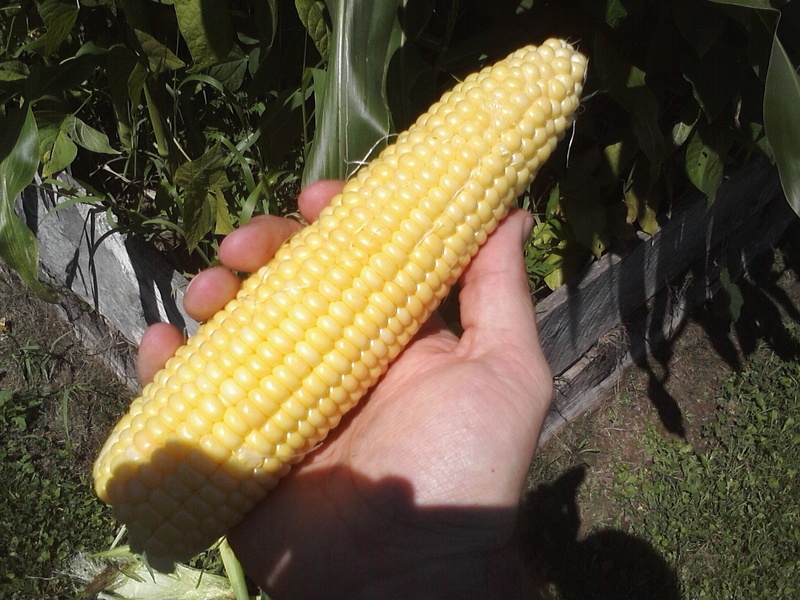 Corn grown by Greenwood students. I have posted before about the outdoor classroom at my school. The outdoor classroom was created almost on a whim when our school was built back in the 70s, a patch of land next to school which could have just as easily been more parking or another soccer field was instead set aside in order to preserve an outdoor education setting. The classroom is a few acres (or about three city blocks for those of you who don’t know how much area a horse can plow in a day) which contain an orchard, a well-established forest, and a pond, which is home to ducks, tadpoles and lots of bullhead catfish. The students use the classroom year-round; fishing in the fall, ice skating on the pond and snowshoeing in the winter. Thanks to being fenced in destructive deer are kept out and other animals like foxes, rabbits and birds are allowed in. Last spring as part of a horticulture project that my gifted and talented students did, the students refurbished two raised flower beds in the orchard. 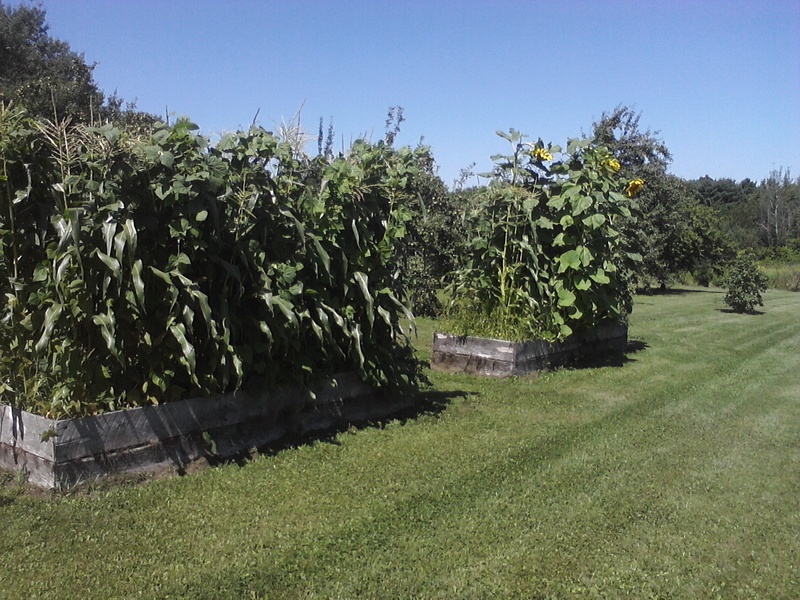 They tore up the weeds that had taken over and planted beans, corn, pumpkins, and sunflowers. We left the seedlings over the summer to develop. Now, wonder of wonders: the garden looks like a big wall of green. Corn eight feet high and sunflowers that look like small trees; the beans wrapped around everything; the pumpkins exploding out into the lawn. A "wall of green" in the outdoor classroom. 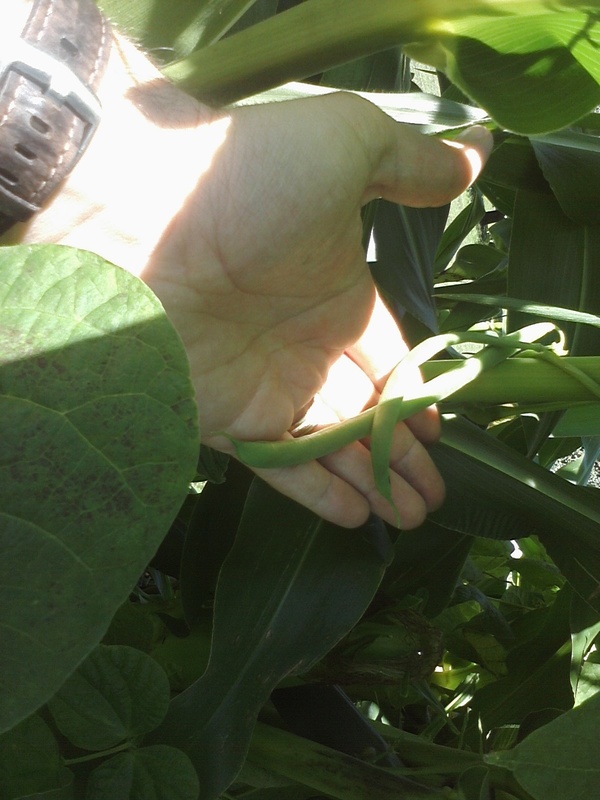 I checked up on the garden this week and filled my basket with fresh sweet corn and pole beans. The fruit trees planted decades ago by the founders on my school were drooping from the weight of ripe plums, apples, and pears. I wish that school would start a little early so my students could share in this harvest, but among the staff that I shared my basket with, it makes a fine fringe benefit. Hopefully they will stay green a little longer until the students show up next week.